Arutz Sheva hears from Claims Conference EVP at event honoring 14-year-old girl murdered in Sobibor whose pendant was found last year. 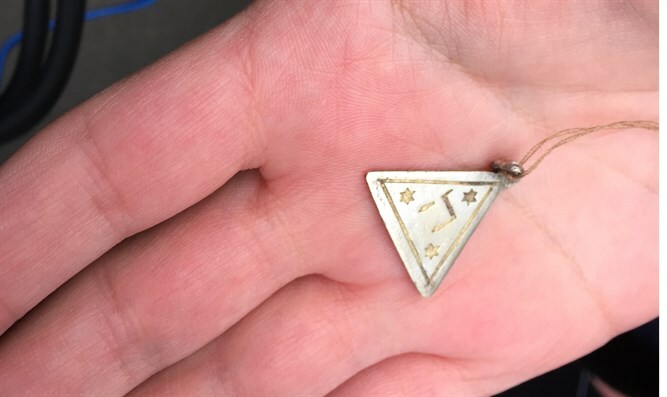 Arutz Sheva spoke on Monday with Greg Schneider, Claims Conference Executive Vice President, during an event in Frankfurt honoring Karolina Cohn, a 14-year-old girl murdered in the Sobibor death camp during the Holocaust, whose pendant was found in the camp last year. “The importance of today is to string together different pieces. We have archival material that we’ve funded at Yad Vashem, excavation at Sobibor, there’s the genealogy of bringing the family together, and all of it culminates today, in educating people about this girl, what happened to her, but really about a million and a half Jewish kids that were murdered in the Shoah, “ he told Arutz Sheva. On the way to her death, 14-year-old Karolina dropped her charm and a year ago the charm was discovered by archaeologists in the area of the Sobibor camp. The silver pendant is engraved with the words "Frankfurt" and the date of Karolina's birth. If it had not been for the excavations at Sobibor, Karolina and her immediate family would have been forgotten. Her family met on Monday for a moving reunion 70 years after the inferno endured by the Jewish People. "Our standing here together is proof of our victory over the Nazis, who wanted to erase the memory of the Jews in Europe," the family's representatives said at the ceremony. In January of this year, Yad Vashem researchers succeeded in identifying Karolina Cohn as the pendant owner, mainly thanks to a database of lists of deportations and expulsions funded by the Claims Conference, which initiated the commemoration event as part of the organization's activities and support for education, documentation, and commemoration of the Holocaust. The discovery of the pendant led to a study of relatives of Karolina who survived and did not even know of her existence. Twenty-six relatives of Karolina's family arrived yesterday from around the world for a first reunion and took part in laying memorial stones. “Today, more than seven decades after Karolina Cohn was deported from Frankfurt, ripped from the home she knew and forced into a cattle car to be imprisoned in the Ghetto, we remember her life and her death. Somewhere between the deportation from Frankfurt and the death camp of Sobibor, this young girl, Karolina Cohn, was murdered. There was no burial, no cemetery and no gravestone. But today we right a wrong. We lay a marker, a physical tangible memorial to her, reminding the world that she existed, that she mattered, that she was loved. In her memory: WE MUST NEVER FORGET,” Schneider said at the event. “The event today also takes place at an important moment in history when the last survivors are elderly. We are at a point in time when the Shoah is moving from memory, from personal memory to history. As we all stand here today, we join in bond of a common purpose to ensure that this moment in time is documented, that it is not lost in history. That people understand what happened to Karolina and to millions of others murdered because they were Jewish.